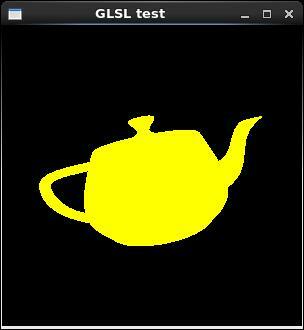 OpenGL에서 사용하는 shader를 작성하는 데 쓰이는 언어를 OpenGL Shading Language (GLSL)이라고 한다. GLSL은 GLslang이라고도 한다. GLSL은 C 언어와 유사한데, C언어를 기초로 만들어진 상위 레벨의 shading 언어이기 때문이다. C언어에서 source code가 compile되어 object 파일로 만들어진 후에 합쳐져서 하나의 프로그램이 되는 것과 마찬가지로, GLSL 또한 source code가 compile되어 shader object로 만들어진 후에 program object에 link되어 사용된다. 하지만 C언어 프로그램은 주로 binary 형태로 배포되는 것과 다르게 GLSL은 source code 형태로 배포된다. C언어로 만드어진 프로그램은 주로 한 종류의 platform에서 실행되지만, GLSL 코드가 구동되는 GPU의 종류는 한 종류가 아니기 때문이다. 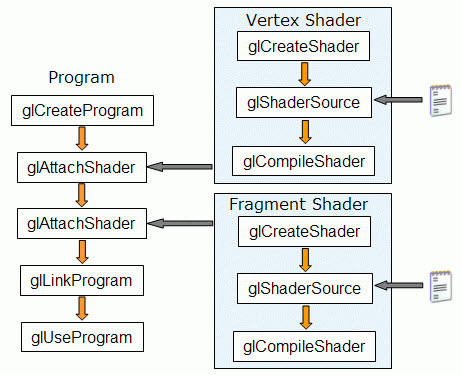 GLSL에서 사용 가능한 shader는 vertex shader와 fragment shader이며, 최근에 geometry shader가 추가되었다. Shader를 사용하려면 다음의 과정을 거쳐야 한다. 2. Shader object에 shader source code 연결. 5. Compile된 shader를 program에 attach. 7. 그리기 전에 어떤 program을 사용할 지 선택. 다음은 각각 하나의 vertex shader와 fragment shader를 사용하는 예제이다. #include <GL/glew.h> // "glew.h" must go before "glut.h"
// Open the file and move the current position to the end position of the file. // 1) Create a shader object. // 2) Load a shader source code from a file. // 3) Specify the shader source code. // 4) Compile the shader. // Check the compile status. // Create a program object to attach the shaders into. // Attach the compiled shaders to the program object. // Link the program object to the application. // Disable the programmable processors so that the fixed functionality will be used. // Set the color for the initialization, and reinitialize the color and the depth buffer with it. // Turn on the depth test. // Viewport Transformation: Set the size of the photo. An then, print on it. // Projection Transformation: Set the lens of the camera. And then, click the shutter of the camera. const double fovy = 45.0; // The field of view angle, in degrees, in the y direction. const double win_aspect = (double)win_width / (double)win_height; // The aspect ratio that determines the field of view in the x direction. const double zNear = 0.1f; // The distance from the viewer to the near clipping plane. const double zFar = 1000.0f; // The distance from the viewer to the far clipping plane. // Viewing Transformation: Set the location and the direction of the camera. // Modeling Transform: Locate objects and/or lights in the scene. // Set the shader program. glFlush(); // To execute all commands in the command buffer sequentially. glutSwapBuffers(); // To swap the back buffer fot the front buffer (double buffering). // Pass-through vertex shader to do the fixed functionality. // Use Method #3 to get the invariance with fixed functionality.